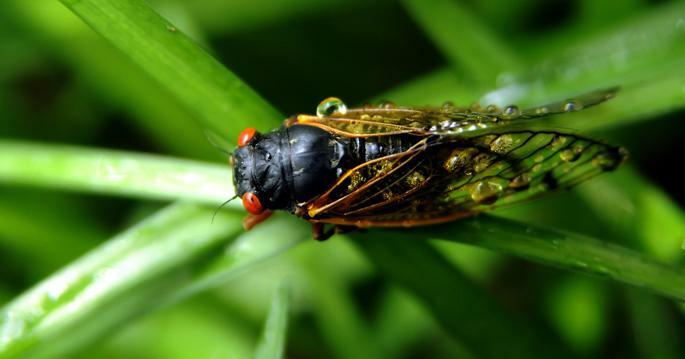 A swarm of cicadas that left thousands of insect carcasses across the Vanderbilt University campus in 2011 is leading to transinstitutional research at the Vanderbilt Institute for Surgery and Engineering (VISE) and Vanderbilt University Medical Center (VUMC) to develop a surgical planning tool to help restore speech for people with vocal fold paralysis. Haoxiang Luo, PhD, who specializes in computational modeling of fluid-structure interaction (FSI) for biological systems, brought some of those cicadas back to his Computational Flow Physics and Engineering Laboratory and created a model of their wing movements. Luo, an associate professor of Mechanical Engineering and Otolaryngology, has made similar models of the aerodynamics of a hummingbird's wing and the hemodynamics of blood as it interacts with heart valves, among other fluid flow systems. His VUMC collaborator, Bernard Rousseau, PhD, MMHC, associate vice chair for research in Otolaryngology and associate professor of Otolaryngology, Hearing and Speech Sciences and Mechanical Engineering, found similarities in the way the cicada wings moved and the movement of human vocal folds, leading them to wonder how the model might be used to improve surgical techniques for paralyzed vocal folds. This has culminated in the National Institutes of Health awarding a five-year, $2.4 million research grant to a multidisciplinary Vanderbilt team to design a software tool to help surgeons develop more precise surgery plans for the most common surgical intervention for unilateral vocal fold paralysis, type 1 laryngoplasty. Rousseau is the principal investigator of the multidisciplinary team, which includes Luo and Gaelyn Garrett, MD, Professor and Vice Chair of Otolaryngology. Vocal folds are located on both sides of the larynx and must come together and vibrate to produce sound. The study is focusing on unilateral vocal fold paralysis, which is when one of the vocal folds fails to close completely against the other. People with the condition have a hoarse voice, and require more effort to produce sound. They often experience vocal fatigue and become winded during everyday activities. Such issues can seriously impact quality of life, leading to loss of productivity at work and long-term disability. Type 1 laryngoplasty involves stabilizing the paralyzed vocal fold with a small implant that helps a person produce voice and also breathe more easily. Patients, who are alert and under local anesthesia during surgery, may be asked to sing "Happy Birthday" during the procedure to determine whether the implant was placed correctly. The challenge for surgeons is that every patient's anatomy is unique — one patient may have smaller cartilage, while another's soft tissue may be less elastic. This makes it challenging for even a very skilled surgeon to determine the optimal size, shape and placement of the implant for a specific patient. As a result, some type 1 laryngoplasty patients need to have their implants adjusted. "Currently, this surgery depends on recreating a three-dimensional structure with only two-dimensional data," said Garrett, who is also senior executive medical director of the Vanderbilt Voice Center. "The symmetry of vibration provided by the new 3-D planned, patient-specific implant should give more consistent and optimal voice outcomes." The surgical planning tool that Luo and Rousseau plan to develop could help surgeons develop customized implants for each patient. "By simulating the dynamics of glottal airflow, the mechanics of the vocal fold tissue, and their interaction after incorporating a surgically placed implant, the computer software will predict how the implant will affect the vibration prior to the surgery," said Luo. "It will also help figure out the optimal parameters of the implant such as its shape, size and placement in the voice box." "We hope this pre-operative planning tool will improve not just the outcomes of this particular procedure for the surgeon, but also reduce the overall costs associated with the procedure and operative time needed to complete the procedure, leading to improved surgical precision and efficiency in the operating room," Rousseau said. FSI modeling for biological systems, such as cicada wings or vocal folds, is challenging and has not been extensively explored. "Vocal folds are extremely delicate tissue, and the glottal airflow when we speak produces considerable vortices, or swirls, that are hard to describe mathematically or to capture in a computer simulation," said Luo. "We had to design high-fidelity and yet efficient computational tools to simulate the vocal folds and airflow." Rousseau, Luo, and colleagues are building on findings they published in 2014 in the Journal of Computational Physics that show that Luo's numerical method is versatile and is well-suited for modeling a range of biological FSI systems, including structures that have both stiff and pliable layers, such as the vocal fold. The researchers say they eventually hope to use computer modeling and 3-D printing to help surgeons customize implants for each patient. "Our goal by the end of the five-year project is to have a model that is ready to be used for the translational milestones of this research," Rousseau said. Ron Eavey, Guy M. Maness Professor and chair of Otolaryngology and director of the Vanderbilt Bill Wilkerson Center, praised the research. "Talented and creative individuals, when incubated together in a rich environment such as VISE, can devise some really wicked cool ideas to assist patients," he said.